Terra is growing. I met my writing deadline on Monday (thanks for all the kind words), and then promptly stopped posting, turning my attention instead to everything I’d let pile up. In between wrangling laundry, paying bills, and prepping for my other campus responsibilities, it appears that I managed to knit a few (or twenty) rows. I said it before, but I’ll say it again: everything brokeknits says about this pattern is true. It is just what I need right now. And with that, I’ve got a morning section to prep for. Happy almost-the-weekend! 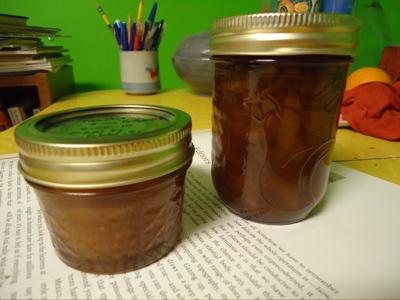 This entry was posted in blogland, knitting and tagged blogland, farmers' market, knitting, peace fleece worsted, peach and bourbon preserves, peach and rum preserves, terra by barefootrooster. Bookmark the permalink. congrats on meeting your deadline. Love the colour of your terra. Only one more day till weekend! Happy Friday! That shawl is magic, non? I’ve got to get the contrast issue resolved and get back to knitting … yours will be lovely! High five on meeting the writing deadline! And good luck catching up … the weekend is almost here!! Hurray for meeting deadlines! 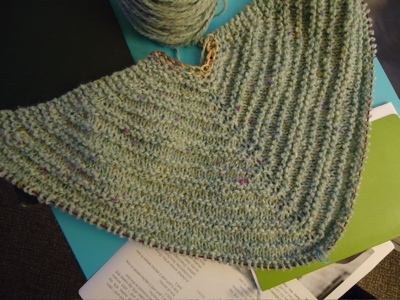 It sounds like Terra is quite the perfect project for academic knitting — I should give it a try.